I just sheared the shaft and gearbox on a 451 snowblower. Most parts are no longer available according to Cub Cadet . Anyone have any experience modifying a snowblower to fit this tractor . The cub cadet blower never really cut it so i would like to explore something that will blow snow into tomorrow. It is on a 2182 which is a pretty incredible tractor . Originally had it on the 1541 and it pretty much sucked . Ken - Welcome aboard! I agree that the 450/451 blowers are not up to the same performance as the rest of the tractor and other attachments, but I also don't think they are terrible either. Specifically, make sure that you have been using a 6" pto with the 451, not the early 4.5" pto. Broken parts leads me to believe you hit something or had the spirals packed with wet snow that turned into a cylinder of ice. Anyway, cruise through that thread above. Parts are generally available used but it is probably more cost effective to find another used 450/451 (depending on what pto you have). Custom would be interesting, but the only other blowers I have experience with are Ariens walk behind models. For whatever reason, their spirals are designed in a way that resist the snow packing in them much better. Generally a walk behind isn't going to be nearly as wide as our 45" tractor mounted, so they wouldn't be a good candidate to adapt. Good to have you here, post up any progress you make! I just received a reply from Berkomac a company that makes blowers for cub cadet and i got a so sorry not available. Yep i did hit a pallet and the shaft sheared off at the shear pin which was pretty worn to start. I had another blower on a 1541 which i installed on the 2182 . It worked quite a bit better on the 2182. The original blower has an exploded gearbox and a gear that need dentures so no luck using that . I ended up pulling the shaft out of the 1 and the gear from the other but now find that the wear on the parts is likely not worth doing. So i guess i will explore putting a bucket on the tractor as it only has 600 hours. 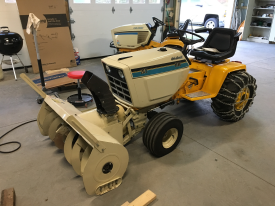 My 2 walk behinds are both Ariens 825 and 828 form the mid 80s and they are still like new and yes they are much better blowers that what was on the cub. I will check the link and see if i can rebuild the blower. I see references to a 551 blower . Is that a good fit for the 2182 as well. If so that does give me 1 more model to watch out for. All of that is explained in the link I provided. Thanks It is a 6 in PTO . I am trying to piece the unit together with old parts from both blowers as we are expecting a lot of snow. Yes, 551 is a good choice as well. They are a bit lighter steel but do work well. The only difference between the 450 and 451 is the main gearbox ratio, all other parts are interchangeable. With the 6" pto you should be using either the 451 or 551 blower. Nothing wrong with building one good one out of two 451. Keep your remaining spare parts. Start hunting for the missing parts and you can piece the second blower back together. These blowers are very sensitive to low rpm. Get a tach and check your high idle (full throttle) and make sure it is all the way to 3600 rpm with no load. Ken, Please post the serial numbers of your tractors, that will be on the tag on the side of the tunnel by your left foot. From those it is easy to tell which PTO and blower you need. The 1541 could have come with either. The serial number break is at 821,101. Below that you run the 450 blower, above it you can run the 451 or the 551 as those tractors should all have the larger PTO. Parts wise, if you broke the main auger shaft they are easy to make. They are simple round stock with a keyway and a couple holes drilled through them. But they can also be grabbed out of any of the three blowers listed as they all use the same shaft. The front auger gearbox is available but $$$$. The only item on the 450/451 that isn't available new is the main drive gearbox. BUT rebuilding those is possible, the housings and internal shafts/bearings and seals for the 450/451 are the same, just the gears are different. Be careful on using s/n to ID ptos In This era, I have seen to many tractors that have had the PTO changed out, whether at the dealer or by a PO. ALWAYS measure your PTO to know what you really have. PTO for the 782-1541 are all the same so any could have the 6” PTO. The same should be said for the blowers ALWAYS check your gear ratio the gear boxes can be changed/rebuilt for the other ratio. 450/451 look the same I never trust the tag!